Margaret Meyers, "The Ku Klux Klan in LeGrande, Oregon, 1918-1924"
Articles reporting and commenting on this decision appeared in Catholic and secular publications throughout America in 1925. Though this article contains text of the decision, its sub-title reflected interpretation of the decision by the NCWC. 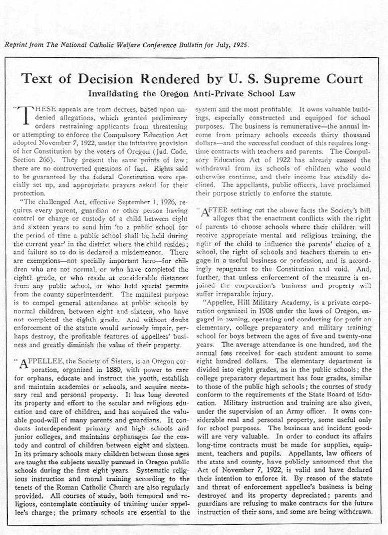 According to the information presented here, why did the Sisters and Hill Military Academy oppose the Compulsory School Law? What was the decision of the Supreme Court regarding this law? How is the Compulsory School Law referred to by the editor of the National Catholic Welfare Conference Bulletin? Why do you think this title was chosen for the law? On what other grounds might the Sisters and Hill Military Academy have opposed the law? Do you think other grounds would have been as effective? Why?